Nanxi Liu, co-founder and CEO of Enplug, Inc., gives the keynote speech at SCE’s 11th annual AAPI Heritage Month celebration. Kim Yamasaki, CAUSE executive director, and Charlie Woo, CAUSE board chair, accept SCE's Community Partnership Award. Thomas Suh (left) and James M. Lee, both with LTL Attorneys LLP, accept SCE’s Diverse Business Enterprise Award. 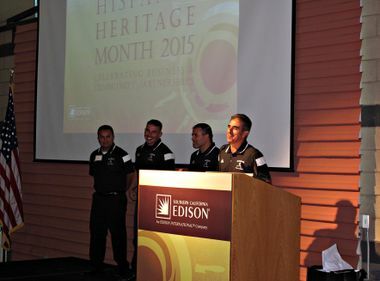 Ariel Fan, Brighton Management energy operations manager, at SCE’s 11th annual Asian American Pacific Islander Heritage Month celebration. Nanxi Liu is keynoter at the annual SCE event that recognizes business and community partners. Nanxi Liu has never let limited resources hold her back. Born in rural China with no running water and separated from her parents until she immigrated to the U.S. at 5, Liu lived in subsidized housing with her family and participated in her school’s free lunch program. She eventually learned English and figured out ways to get “cool stuff” like her friends. Playing piano led her to competitions and prize money she used to buy her first car. She paid her way through UC Berkeley — earning straight A’s — by entering beauty pageants with scholarship awards. “I’ve won tens of thousands of dollars doing pageants,” said Liu, CEO and co-founder of Enplug, Inc.
She admits to choosing “quirky paths” toward personal and professional success. A visit to a dive bar in Colorado, where she met a “cute guy” while a college senior, resulted in them co-founding a successful startup that develops polymers that enable vaccines to survive without refrigeration. Her latest startup, Enplug, is the No. 1 open software for digital displays that let businesses manage and distribute content. The award-winning software is used by startups and Fortune 500 companies around the world, including malls, stadiums, hotels and banks. 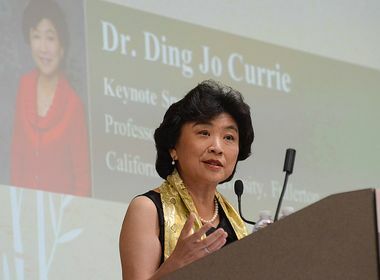 Her funny, unapologetic stories of self-determination and success resonated with 200 guests attending the 11th annual Asian American Pacific Islander Heritage Month celebration. The event celebrates SCE’s business and company partners and recognizes AAPI energy-efficient champions. The month-long May celebration commemorates the immigration of the first Japanese to the U.S. on May 7, 1843 and marks the anniversary of the completion of the transcontinental railroad on May 10, 1869. Most of the workers who laid the tracks were Chinese immigrants. Serving one of the most diverse regions in the country, he added, enables the utility to benefit from a variety of perspectives, backgrounds and opinions that help SCE better understand its customers. Brighton Management (Energy Efficiency Participation Award), a Chinese-owned company that owns or operates 45 major hotels based in Irvine. Center for Asian Americans Unified for Self Empowerment (Community Partnership Award) is focused on transforming lives and meeting the diverse needs of the AAPI community through active engagement in philanthropic activities. 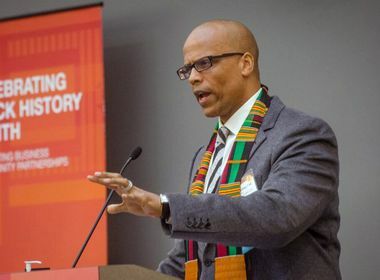 LTL Attorneys LLP (Diverse Business Enterprise Award) is one of the country’s largest minority and women-owned law firms whose attorneys serve on boards of nonprofits, volunteer their time with local community agencies and work on high-profile pro bono cases. Dr. Ding-Jo Currie knows the value of an education. It changed her life and made her the woman she is today, a successful leader of Asian descent, accomplished educator, lifelong learner and an advocate of higher education for more than 30 years.